What can visitors expect to find on your website? Founded in 2005, PyrexLove.com is one of the first websites to focus exclusively on vintage milk glass Pyrex, with an extensive and comprehensive pattern guide for vintage Pyrex collectors. What inspired you to start the site? Other than one collector book, there were just a few online resources for collecting vintage Pyrex, and many of them were outdated. Being web designers by trade, we decided to start up a reference site for fellow collectors. We also started a Flickr group where many collectors connected with one another and would help name many unknown pieces. Currently, there are 2,850 Members and 30,900 photos in the group since it started over ten years ago! 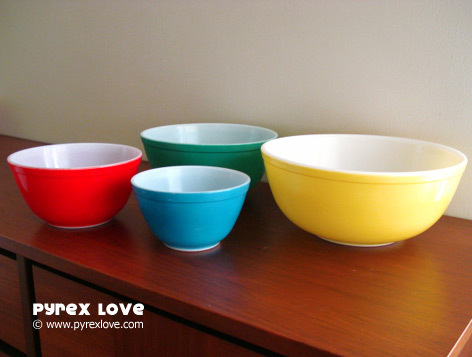 We are so happy to see how much the love of vintage Pyrex has grown over the years. What drew you to Pyrex in the first place? In 1997, we bought a house that was built in 1949. It had a period-specific kitchen, with beautiful ceramic tiles in pastel yellow and light turquoise. We went on eBay to look for kitchenware to match, and came upon the iconic refrigerator dishes in primary colors. One piece lead to another, and soon we had vintage Pyrex pieces numbering in the hundreds! Our favorite pattern that is always on display is the “New Dot” mixing bowl set. For everyday use, we love the rectangular baking dishes, especially the 9×13 size for baked pastas, casseroles, and enchiladas. Thanks Linda! 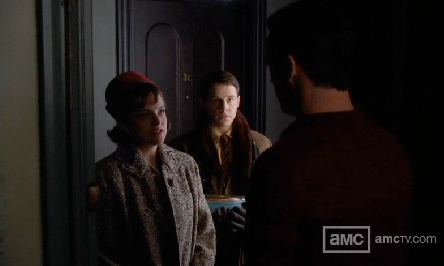 Be sure to check out Pyrex Love including a list of dishes spotted on TV and films.